Between talking and chewing, your jaw moves thousands of times a day. Most people take these actions for granted and never think twice about it but movement of the jaw is very important -- movement of the jaw allow you to enjoy food and begin the digestion process. Your jaw bone, or mandible, depends on a few important muscles that allow you to chew food and gum and talk all day long. The massater connects your jaw to your cheek bone and is the prime mover of jaw closure. You can feel this muscle contract when you place your hand on your jaw and clench your teeth. 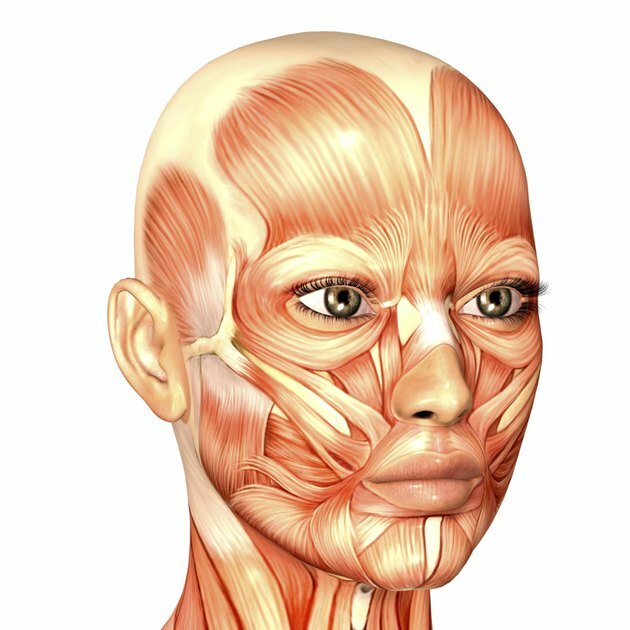 The temporalis is a fan-shaped muscle that covers the side of the head. This muscle closes the jaw, elevates and retracts the mandible, assists in side-to-side movements and maintains the position of the mandible at rest. This is a deep two-headed muscle that runs along the internal surface of the mandible. It works together with the temporalis and masseter muscles to elevate the mandible. The medial pterygoid muscle also acts to protrude the mandible and promotes side-to-side, or grinding, movements. The lateral pterygoid is also a deep two-headed muscle and lies above the medial pterygoid muscle. This muscle works with the medial pterygoid muscle to protrude the mandible and provide side-to-side grinding movements of the lower teeth. The digastric muscle consists of two bellies connected by a tendon to form a V shape under the chin. It acts to open the mouth and depress the mandible. What Are the Names of the Muscles in the Arm & Shoulder? What Are the Functions of the Muscles That Move the Ears? How Do Muscles Move the Body's Skeleton?